IPOB protesters has warned that things are going to get worse in Nigeria after the controversial news emerged that it was only the IPOB leader, Nnamdi Kanu that was granted bail, while three others standing trial with him will remain in detention. Biafrans unsatisfied with the outcome of the proceedings chanted aggressively outside the Abuja Federal High Court, demanding the release of the remaining agitators namely; Chidiebere Onwudiwe, Benjamin Madubugwu and David Nwawuisi whose bail applications was postponed after the judge granted only Nnamdi Kanu bail on health grounds. Huge crowd of Biafrans as well as supporters from other extraction, were all undaunted despite several attempts by the security operatives to dismiss them after Binta read out her frivolous conditions. Governor of Ekiti state, Ayodele Fayose when accosted by Biafrans outside the court premises, and asked about what he felt concerning the outcome of the case before zooming off with his entourage said he was not surprised by the outcome. “I am not shocked. It was expected as you saw the attitude of the judge and the Prosecutor. There’s absolutely no reason why the other IPOB members was denied bail today. 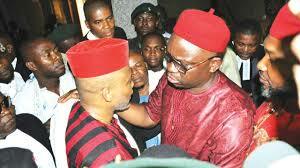 Let us not behave like we didn’t know that this would be the outcome of the trial‚” said Fayose. “We must not retreat and we must not surrender. The best thing we can do for those that were not released is to make sure that the Nigerian government feels our wrath‚” Emeka Ikenna one of the protesters said. “We must cannot maintain status quo. Nigeria must know that they have committed a crime against us, they must release the remaining IPOB members, It is time to show our true colours.” Igweocha women zone lamented. The denial of bail prompted IPOB protesters in Abuja to say that the fight will continue starting with a massive rally in Abuja.